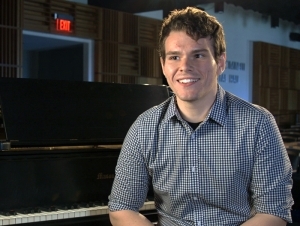 Music has always been an integral part of Buffalo State senior Tim Schmidt’s life. As a child, he reveled in the rich harmonies produced by the organist and choir at Calvary Lutheran Church in Amherst, New York, where his father serves as pastor. When he was in sixth grade, Schmidt starting taking private piano lessons and quickly became adept. He played piano in the orchestra at Kenmore East High School and accompanied the choir to a competition in Washington, D.C. By his senior year, Schmidt’s musical proficiency landed him a spot within the Buffalo State Music Department. Meanwhile, his top-notch grades qualified him for acceptance into the college’s Muriel A. Howard Honors Program. “I chose Buffalo State because it has an excellent music program, has a good sense of community, and it was easily accessible,” said Schmidt, who commutes from his family’s home in Tonawanda. As much as he loves the piano, Schmidt knew he didn’t want to pursue a music career. As a freshman, he was unsure exactly what he wanted to do. He explored courses through the Communication Department, and by his sophomore year, arrived at a second major, public communication, along with two minors—political science and public administration. Together these disciplines directed him toward his chosen career path. In the fall, he’s entering a master’s program in public administration at Syracuse University with the ultimate goal of working in state government. It’s an impressive enough feat to graduate with dual degrees and two minors within four years. But Schmidt accomplished this while maintaining a 3.95 grade point average. He also delved into an intensive independent study research project in the fall of 2016. His performance prompted assistant professor of political science (public administration division), Jason Rivera to invite Schmidt to help him conduct research on representative bureaucracy during the spring 2017 semester. Although he won’t pursue music professionally, Schmidt said he’s grateful he auditioned for the music program. He’s enjoyed the opportunities he’s had to play with campus ensembles and as an accompanist for vocalists. He’s also made good friends within the department. “You are involved with these students from the very beginning so it’s hard not to make friends,” he said with a smile. Through all his experiences at Buffalo State, Schmidt said he feels prepared for life after graduation. When he decided to pursue public administration in graduate school, Schmidt said he found great faculty support. Other students should expect to find similar support at Buffalo State.